It was a brief press conference but did give an impression that Mehbooba has gone back to the basics of politics. SRINAGAR: After facing rebellion and losing key members, Peoples Democratic Party (PDP) chief Mehbooba Mufti has gone back to basics of politics and moved away from 'inner coterie' to save her party and prevent further desertions. Mehbooba addressed a press conference at her Fair View residence at Gupkar Road, Srinagar on Friday to express her concern over possible granting of divisional status to Ladakh region by Governor administration in Jammu and Kashmir and ignoring of Chenab Valley and Pir Panjal region. It was a brief press conference but did give an impression that Mehbooba has gone back to the basics of politics. Unlike past, Mehbooba was not flanked by any of her relatives or member of "inner coterie". he 59-year-old politician was flanked by PDP vice president Abdul Rehman Veeri and party's chief spokesman Rafi Ahmad Mir. It was quite contrary to her past press conferences when she used to be accompanied by any of her relatives or member of "inner coterie also known as kitchen cabinet". Mehbooba was accused of nepotism and favouritism by party leaders immediately after the fall of PDP-BJP coalition government headed by her in June this year. She was accused of turning the PDP into party of relatives and listening only to their suggestions and ignoring the suggestions and advices of senior party leaders and legislators. Former finance minister Haseeb Drabu, influential Shia leader Imran Ansari and his uncle Abid Ansari have resigned from the party so far. Another senior party leader and MP Muzaffar Hussain Baig, who was one of the founding members of PDP, is also feeling ignored and left out, and has also hinted at quitting the party and joining BJP ally Sajjad Gani Lone's Peoples Conference. After the first sign of rebellion in the party, Mehbooba removed her maternal uncle Sartaj Madni from the post of PDP vice president. Besides, her cinematographic brother Tassaduq Mufti is also maintaining distance from the party affairs. Both Madni and Tassaduq along with another party leader Naeem Akhtar had emerged as PDP face during over three years PDP-BJP coalition government in the State. There was resentment against the trio in the party but Mehbooba overlooked it and divested them of party posts only when damage had been done, party insiders said. 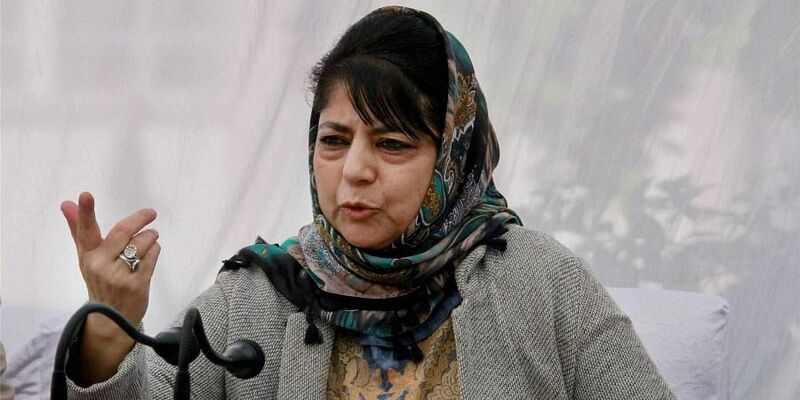 According to PDP insiders, Mehbooba may hold meetings with senior party leaders including ex-MLAs to know their opinion on how to contest the next Assembly elections, scheduled be held within six months after dissolution of the State Assembly by Governor Satya Pal Malik last month. A political analyst, Aadil Ahmad, said Mehbooba has no option but to fall back on party leaders and take them along to save her party from further disintegration. He said Mehbooba has given a hint that she is more "accommodative now" and hopes this would prevent further desertions in the party. The PDP chief spokesman Rafi Ahmed Mir said he and Veeri accompanied Mehbooba in the press conference as part of organisational setup. He said earlier PDP was in government and the ministers used to accompany Mehbooba during the press briefing. "But since we are no longer in party, she is now being accompanied by party leaders". "There is no change," he added.